Table 1 presents a summary of typical plaster properties under standard test conditions. 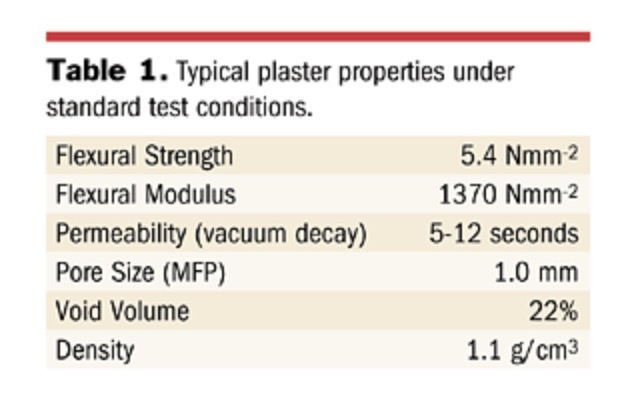 This information suggests that plaster is best described as a stiff/brittle material, having a relatively low flexural strength but a high flexural modulus. It clearly has an open cell structure, with a degree of permeability and a mean pore size of 1 micrometer.Clearly a new mold material could benefit the manufacturing process. But what information is relevant to the development of a new material that would be suitable for replacing plaster as a casting medium? This question is not as simple as it may at first appear. Not only are the material considerations important, but the process variables are also significant. Once the material properties have been evaluated for a particular process, and a test material that matches these properties has been produced, the next step is to determine whether the material is commercially viable. When this final obstacle has been overcome, the material is ready for trial, first in-house and then eventually at a manufacturer’s site.Through the constant development of new materials and the inherent understanding of which parameters are critical for each process, materials and production methods have been developed and refined to provide new products that redefine the material boundaries and processes involved. The key requirements for a mold material for use in the pressure casting process are high strength, consistent permeability and low shrinkage. Casting pressures can vary from 5 bar for medium pressure sanitaryware to 40 bar for tableware pressure casting. Pressure is the driving force in this casting process; therefore, a material with natural capillarity is not required.Most materials currently available for use in the pressure casting process have a pore size around 10 microns, but these molds require frequent water flushing to prevent pore blockage and blinding. A unique fine pore material has been developed that avoids the requirement to back-flush molds with water between cycles. Careful control of manufacturing conditions is required to obtain a consistent surface permeability and dimensional control. Molds that have produced over 55,000 pieces are in operation at a number of manufacturing sites around the world. The key properties of plaster to be reproduced in a new material for ram pressing are its fine pore size and healthy appetite for water. The driving force for de-watering between cycles in ram pressing is pressure, which means that while high absorbency is required to dry the mold surface after de-watering, the actual material affinity for water needs to be relatively low to provide fast de-watering and rapid turn-around between cycles. While this might appear to be somewhat paradoxical, a successful compromise was eventually found.The key advantage offered by synthetic ram-pressing molds over plaster is the material’s inherent strength, which can give mold lives of well over 10,000 pieces. Many tableware producers have operated exclusively with such ram pressing molds for several years, enabling them to reap the benefits of longer mold lives, reduced mold costs per piece, improved yield and the elimination of plaster mold-making costs.